Så efter mange måneder og masser snak med Jess og Mads om tegnet, har jeg lavet min beslutning. So after many months and lots of talks with Jess and Mads about the symbol, I have made my decision. I have never been a student of the zodiac or read my daily horoscope, but something about this sign kept speaking to me. 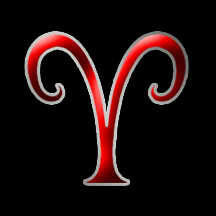 It is the symbol for Aries (for birthdays between March 21 and April 19) and is represented by the ram. Aries stands for new beginnings in the zodiac calendar which it quite appropriate considering my last 10 months. Aries is the sign that our baby who we lost in September would have been born under. Det er ikke så vigtigt at tatoveringen er vædderen--kun at det repræsenterer zodiaks udgangspunkt og er en daglig påmindelse til mig at i dag er en ny begyndelse... hver dag efter i dag er en ny begyndelse også. It's not so important that the tattoo is a ram-- only that the sign I chose represents the Zodiac's new year/new cycle. This will make it a daily reminder to me that today is a new beginning.... and each day after this is a new beginning as well. Well, my question is how many do you have? Does Mads have some too? I watched a friend get one last year in Sedona. What an experience for me. Good luck, and do what feels good to you. May each day bring new beginnings, laughter and hope! I really like the significance behind your new tatoo. Awesome.